What effects will Louisiana see from remnants of Hurricane Willa Thursday? Remnants of the Hurricane Willa will pass over southern Texas and Louisiana starting late Thursday night. 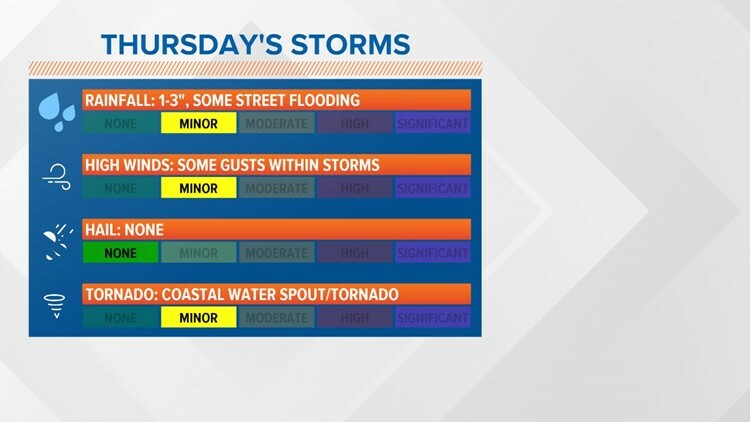 NEW ORLEANS – The remnants of Hurricane Willa could bring severe weather and heavy rain to parts of Louisiana Thursday. Willa made landfall as a Category 3 hurricane near a stretch of beach towns, fishing villages and farms on Mexico Tuesday. Remnants of the storm will pass over southern Texas and Louisiana starting late Wednesday night. ⤷ Download the FREE WWL-TV News app now in the iTunes store or on Google Play. 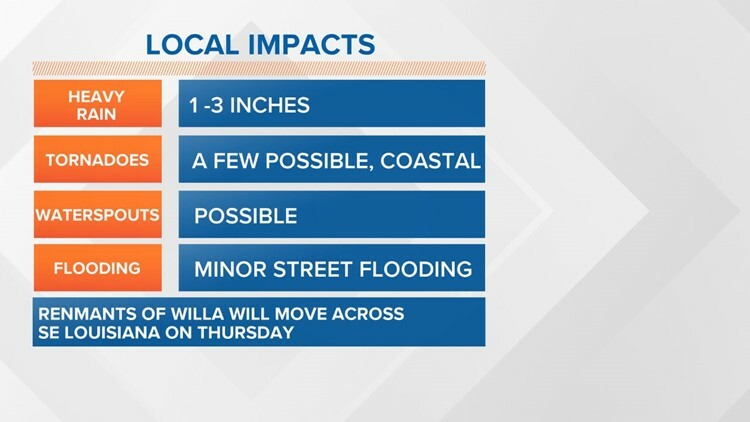 What effects will Southeast Louisiana feel from Willa? Though widespread severe weather is NOT anticipated, a few strong to severe storms are possible as rainfall moves in starting after midnight late Wednesday night. Rain will last through overnight and much of Thursday. 1-3 inches of heavy rain, which could lead to minor street flooding. Rain will begin in the early morning before rush hour and continue into the evening commute home. Possible weak tornadoes and waterspouts, mostly in areas along the Louisiana Gulf Coast. South of Lake Pontchartrain: Starting Thursday morning, a warm front will move inland south of I-10. It will spread scattered showers and storms across Southeast Louisiana. Areas south of New Orleans to the coast of the Gulf of Mexico could see rotating thunderstorms that could develop weak tornadoes and waterspouts. North of Lake Pontchartrain: There will be a threat for heavy rain and a few non-severe storms throughout the day. The atmosphere will be more stable here, so that is why we are not expecting severe weather here. The rain will come to an end Thursday night. We will see cooler weather with lows in the upper 50s north and lower 60s south of the lake for Friday morning.